Updated 2019 FortuneJack Review - Is Fortune Jack Casino Legit? There are quite a few bitcoin casinos opening their doors online right now, but how many have you seen that also take Bitcoin Cash, Dash, FujiCoin, Monero, and other cryptocurrencies? FortuneJack is an exciting casino site which accepts all of these altcoins and more. 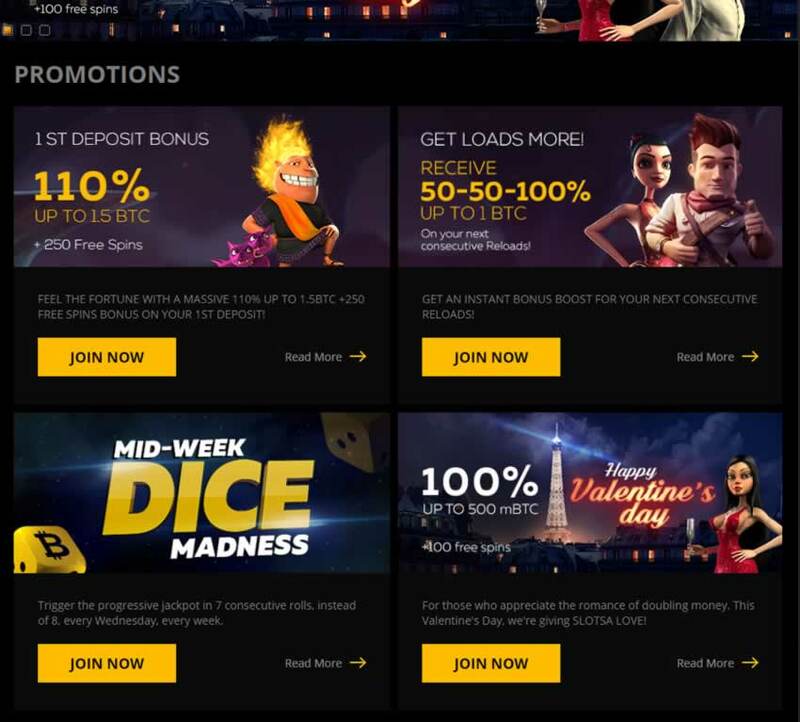 With hefty bonuses, a wide variety of games, and 24/7 support, they have swiftly risen in the ranks to become one of our top recommendations for crypto gambling. Before we recommend any bitcoin casino online, our first course of action is always to check into the company’s reputation. In this case, FortuneJack is owned by Nexus Group Enterprises N.V., a company registered in Curaçao. They are licensed in that jurisdiction under #8048/JAZ2016-026. I first found them when I researched the best ETH casinos that people could trust. They made my shortlist then and are still there now. Then what is noteworthy about the team that runs this site is that they have twenty years of experience in the industry. They own both online and brick-and-mortar casinos, most of them located in Eastern Europe. So this is excellent, and does a lot to build confidence in the brand. Opening an account on FortuneJack couldn’t be easier. Start by clicking on the red “Join now” button that you see on the upper right-hand corner of the FortuneJack homepage. Once you do that, you will have a chance to provide a username, password and email address. 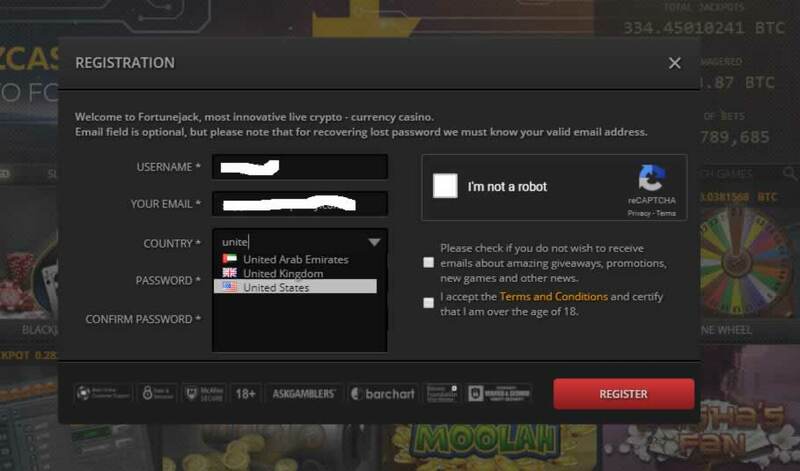 You also will need to input your country (yes, USA gamblers are allowed). After you put in the information and click on the CAPTCHA, your account will be ready to use. If you want, you can also subscribe on this page to the News and Events. This is totally up to you, but I’d recommend it so you don’t miss out on any cool promotions. While you are at it, don’t forget to visit your email inbox to activate your account. This is also necessary if you want to enjoy all the features and bonuses FortuneJack has to offer. Want to increase your security? If you scroll down to the bottom of the account management page, you have the option to enable Two Factor Authentication. Do this. On the right-hand side of the account management page, you will see a menu which you can use to view your balance, make a deposit or withdrawal, claim bonuses, and view messages. Click on “Deposit” if you want to deposit funds. Doing so will display wallet addresses for all of the cryptocurrencies which FortuneJack accepts. QR codes are provided as well, so you can use whichever suits you. Just copy the address or scan the QR code and make the deposit through your cryptocurrency wallet. The only thing that FortuneJack has to say about fees on their site regards withdrawals. I found this to be a bit unclear, so I asked a customer service agent on live chat to clarify. Based on that reply, I would say it sounds like you are unlikely to be charged for a withdrawal, but perhaps if there are excessive networking fees being demanded by your wallet, FortuneJack might opt to pass those fees on to you. Wagering requirements apply even if you do not accept a bonus. In the terms and conditions it stipulates that the “deposit amount must be turned over 2 times before your withdrawal request will be approved. Wagering requirements can be met only by playing on slots, casino games and live games.” Higher turnover requirements apply if you accept a bonus. Each is listed next to the bonus when you activate it. The casino also states that they “reserve the right to divide any payment over BTC 100 into ten installments of 10% each, for 10 months.” This is entirely reasonable however, as that would be a huge jackpot. So all in all, I find the withdrawal policies to be quite reasonable, although the mandatory wagering requirement is a bit annoying. At least the turnover required is low. On the account management page, clicking on “Bonuses” will pull up the available promotional offers. There are also sometimes promotions for free spins. FortuneJack makes bonus codes available from time to time as well. You can enter them on this same page. Browsing the FortuneJack website, I found navigation was simple and clear, and that the site was fast and responsive. Currently, no iOS or Android apps are offered, but they are not needed. The site works great on a desktop, laptop or mobile platform. That means that you have plenty of variety to choose from when it comes to themes, rules, bonus rounds and more. You’ll find a selection of poker, blackjack, baccarat, and roulette games in the live games, so pretty much anything you want to play is available here. One of the things which impressed me the most about FortuneJack was the customer service on the site. If you want, there is a web form you can use to get in touch with the team, or you can send an email. But if you want instant answers, you can turn to the live chat line for support. When I got on live chat, I was greeted instantly by a customer service agent. There was no waiting at all. It is common for me to have to wait a couple minutes on other online casinos to talk to someone. I typed in my question, and the agent typed by a thorough and clear response within seconds. He then wished me luck with my gambling before I left. So he was both knowledgeable and friendly, and it was obvious that he was not distracted from the conversation by other matters (such distraction seems typical on other sites). This chat service is available 24/7, so anytime you have a question, you can get a speedy reply. This is definitely one of the best things about gambling on FortuneJack. Anything Else You Should Know About FortuneJack? There are a few more useful things to know about FortuneJack. The first is that the games on the site are Provably Fair. This is a popular feature on bitcoin casinos which lets you test for yourself to check that the outcomes of the games are truly random and fair. The second cool feature is BitGo™ Instant Deposits. BitGo™ is a secure wallet which is partnering with FortuneJack. Through this partnership, FortuneJack can offer transfers of funds that take “mere micro-seconds” instead of minutes, hours or days. To take advantage of these super-fast transfers, you do need to open a BitGo™ account. This is a weekly competition where you have a shot at winning part of a 2 BTC prize pool. 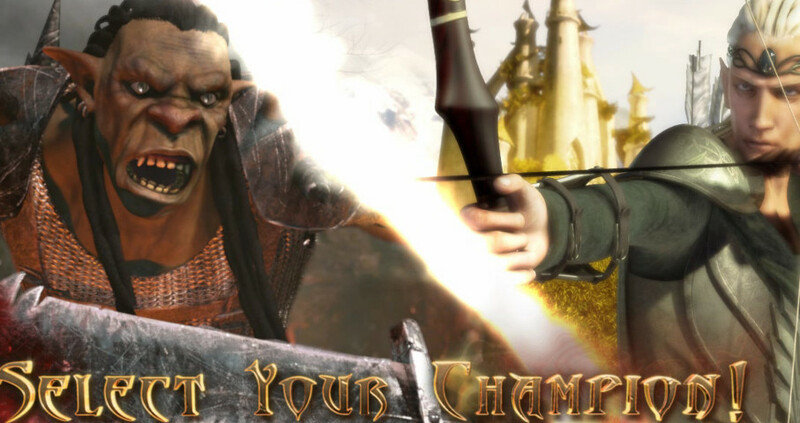 To enter, all you have to do is play the games you enjoy. This allows you to accumulate points, placing you on the leaderboard and moving you up through the ranks. 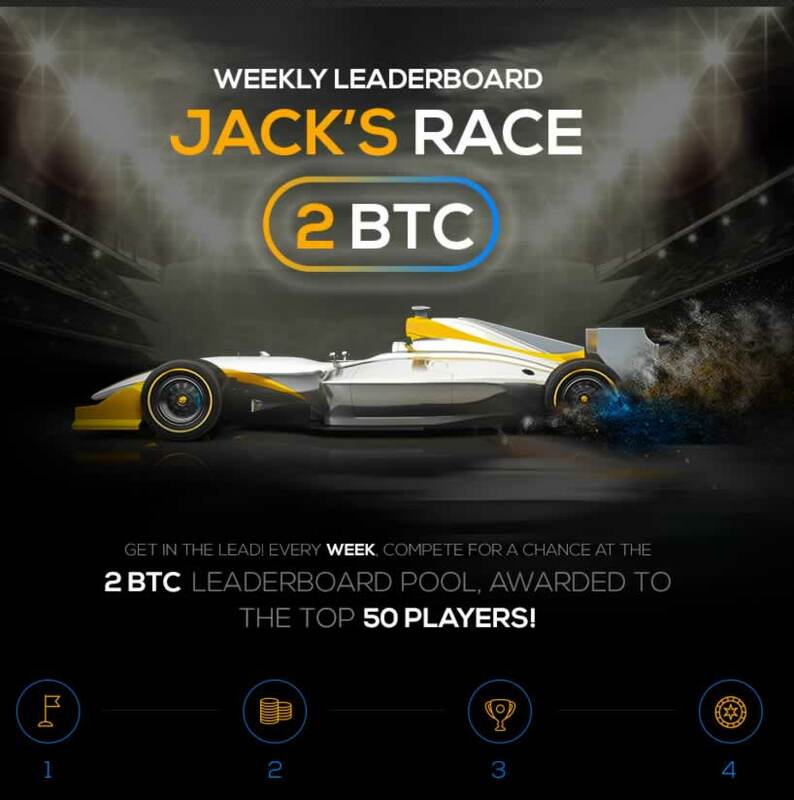 If you manage to make it into the top 50 players on the leaderboard when the contest ends for the week, you will receive a share of the 2 BTC prize pool. You do not even need to opt in or register in any way. You just play, and are entered automatically. If you gamble a lot, this is added value back in your pocket. FortuneJack accepts a lot more cryptocurrencies than the majority of other bitcoin gambling sites I have visited. If you get a BitGo™ wallet, you can enjoy lightning-fast deposits and withdrawals. There are a lot of bonuses, free spins, and other promotions available, including a weekly contest you are entered into just by playing at the casino. Tons of slot machines and other games are available. Deposits and withdrawals are fee-free under most circumstances. Customer service is available 24/7 on FortuneJack and is fast and responsive. I was very impressed with my experience. FortuneJack has a wagering requirement for all withdrawals. You cannot call customer service on the telephone. There are no mobile apps (but this is okay since the site itself is responsive). 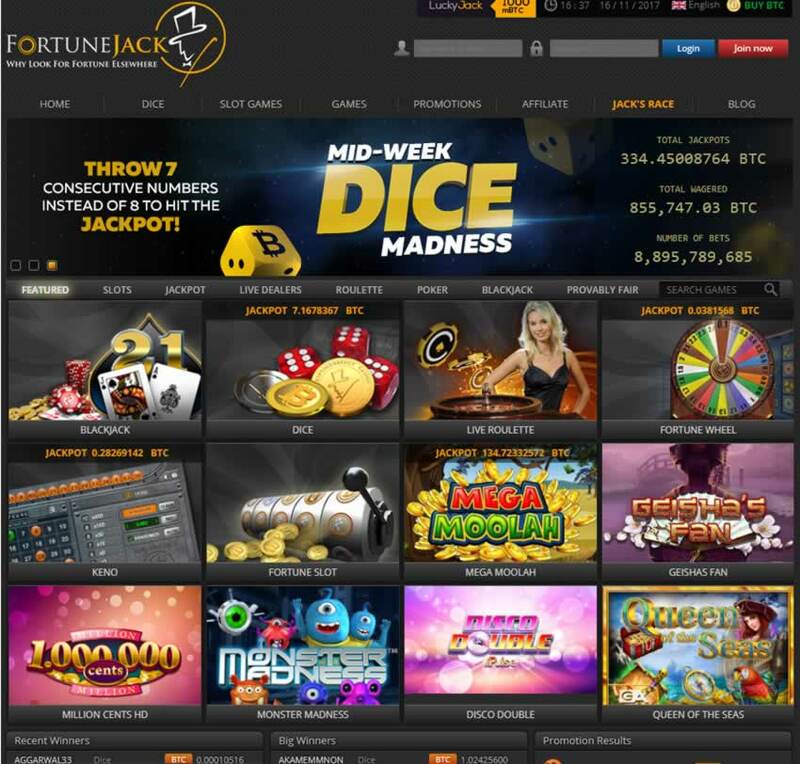 Now you know all about FortuneJack, where you can gamble not just with bitcoin, but with a whole bunch of different altcoins. Aside from the presence of a (small) wagering requirement for all withdrawals, it is pretty hard to come up with any significant disadvantages of gambling on FortuneJack. 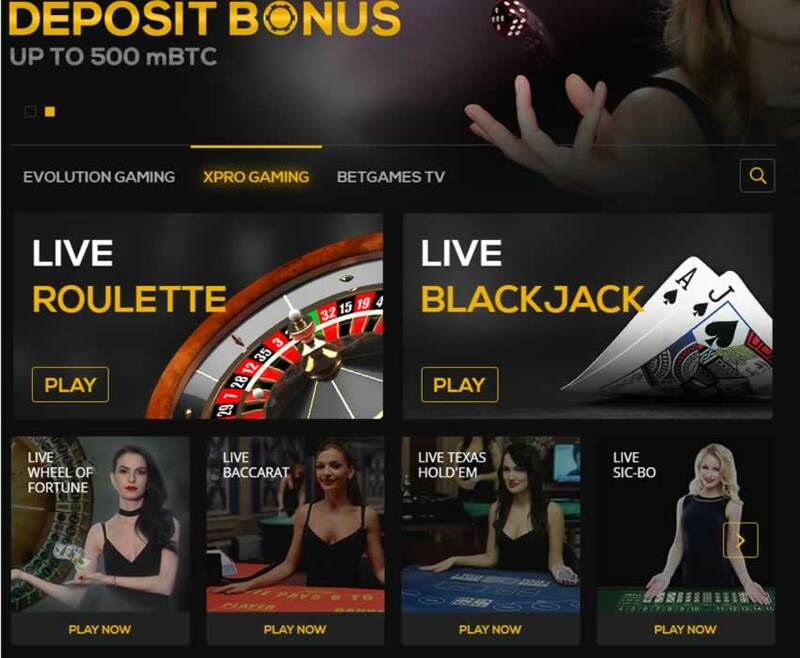 But there are plenty of advantages: tons of deposit options, fee-free deposits and withdrawals, a huge game selection, generous bonuses, and a great customer service team. So what are you waiting for? You can register in seconds and get started gambling with cryptocurrencies on FortuneJack today!